(cost per day .27 per pet) Less Packaging! 100% Palatability Guaranteed: We have a very high rate of acceptability by both dogs and cats. However, if your dog is not satisfied with the palatability of healthymouth, we will unconditionally refund your payment. Easiest way to use healthymouth�: Prepare a larger quantity to keep on hand. Mix 1 table spoon plus 1 teaspoon into a one-gallon container of water. Keep lid on. Not necessary to refrigerate but keep out of direct sunlight. Fill and refill dog's bowl as much as pet normally drinks. Can stay in one-gallon container up to 2 weeks. Change bowl as you would regular water. Will NOT lose efficacy if in bowl for more than a day. Does your dog not drink much water? No problem with healthymouth. 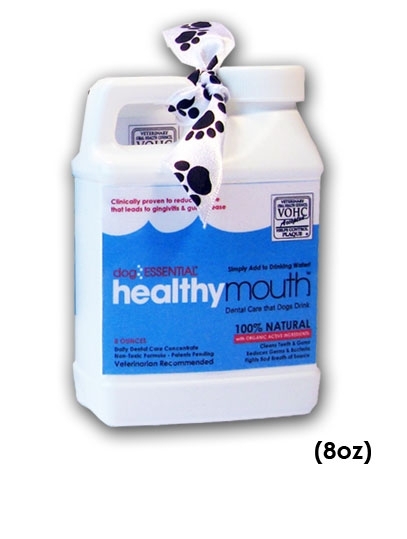 Simply dilute healthymouth in water per instructions and pour directly into your dog�s dry food, wet food, or raw diet (like a gravy) at every meal-time. Pets, by nature will lap up whatever is in its food bowl and your pet will receive the same benefits of healthymouth. Can you use warm water with healthymouth if you add it to the kibble? Yes, BUT make sure that you do not heat the formula or diluted formula. Heat the water and then add it to the healthymouth formula, mix and add to the kibble. What healthymouth� will cost you per day: Healthymouth� is NOT expensive. It is a great value for the benefits it provides. Used by preparing a larger quantity as explained above, healthymouth� will cost you .27 a day for the VALUE JUG, and .22 a day for the SUPER SAVER JUG and .15 for the ECONO JUG. Starting Your Dog on Product: Most dogs will start drinking healthymouth� right away. If your dog does not, do not panic. It is not a flavor issue, it may be a color issue as the natural ingredients will turn the water a pleasant apple green. Dogs can be like kids and rebel against change. 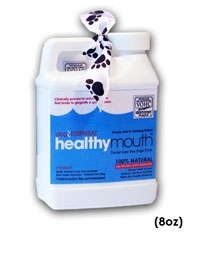 Integrate healthymouth� more slowly by exceptionally diluting it with additional water and each day add more healthymouth� until you have reached the prescribed dose. How Much or How Little Healthymouth� is it Okay For My Dog To Drink: Your Dog cannot drink too much or too little healthymouth�. He will continue to drink as he does with regular water consumption. The benefits of healthymouth� are achieved by the long-term continual drinking and ingesting of the product on a daily basis. Households With Dogs and Cats Sharing Bowls: No Worry. You can use either product for all pets as the clinically proven part of each formula is the same. Dog formula tastes like regular water, cat formula has a natural fish flavoring that most dogs like as well. What Dogs Should Not Use: Natural products have potency like all products. If your dog is on antibiotics after its dental or extractions, we recommend not starting healthymouth� until antibiotics are stopped. We have never had any contra-indications but as you know, antibiotics can upset your pets stomach as they do your own and we would not want you to confuse a stomach ache caused by the antibiotics with healthymouth. If dog is currently on any long-term antibiotics other medications, or has any known hyper-sensitivity or allergies please confer with veterinarian before starting product. Unopened Jug: Good for up to 24 months from date of manufacturing stamped on Jug. Open Jug good for up to 24 months. Ingredients: Click here for the ingredient list. 100% PALATABILITY GUARANTEED: No Risk For Clinic. No Risk For Client. HealthyMouth LLC will unconditionally take back any unit returned to your clinic. Unit price will be credited to you account and deducted from your next order. I have 3 senior cats and a 2 story house. I have 2 large water fountains and multiple bowls (6) of water inside and outside(in their Purrfect fence). With having to keep their water fresh, I end up throwing out a lot of the treated water. And, it takes me a lot longer to have to mix up the solution and then fill all the dishes. I ended up having to take out the filters in the fountains because it filtered out all the additive. One of my cats definitely doesn't like the filtered water. Whenever it rains now, she runs outside to find a puddle to drink out of! She never did this before. I won't be buying the liquid again. I can't say how it's working. One of my cats had a cleaning and the vet recommended this. Product is excellent; however, their customer service is the worst ever encountered with online stores. I called today because an order that should have arrived a week ago was still not received. They hadn't even shipped it! Moral of the story: order your product a month before you actually need it, then follow up with phone calls. Reviewer: mark Acton from Ooltewah, Tn. I had a issue with one of the products and it was resolved promptly. I was very pleased. Good product but Healthy Mouth doesn't support "Border-free international shipping" like many US companies. With the current Canadian dollar value, plus shipping, plus border charges a delivery to Canada is not worth it ~ just buy from a local vet. Returned my package to sender directly from outlet upon pickup from Canada Post; 6 weeks later still no refund. Disappointed in the lack of care and tracking by Healthy Mouth considering I've been a customer for YEARS. (per CP it was returned, their responsibility.) Customer Service? My cat Mitzy has a huge problem with plaque build up. Even a month after a dental cleaning and with me brushing her teeth she has a good build up started. Being very frustrated for her and myself for many reasons I tried any and all suggestions from my holistic/homeopathic vet to no avail. Until, that is he started carring Healthy Mouth. I noticed the product on the counter and thought why not. It has made all the difference!!!! It has been seven months since her last dental and 2 days ago we had a check-up and the vet was very pleased with her teeth. She was having dentals almost every 6 months mind you. Thank you very much Healthy Mouth; you have been a blessing for Mitzy and me!